His Holiness Drikung Kyabgon Chetsang Rinpoche officially apointed Venerable Konchok Dhondrup as the resident teacher of Dri Thubten Dargye Ling with the title Dorzin (Vajra Master) on the 18th February 2008. On 8th June 2008, H.E.Garchen Rinpoche performed the enthronement ceremony and recognized Lama Konchok Dhondrup as Dorzin. In 1984, Konchok Dhondrup took refuge under H.E. 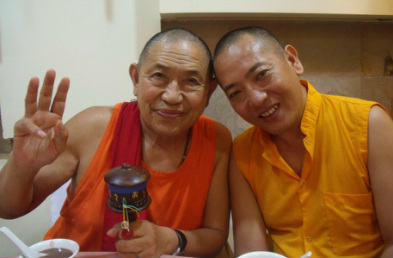 Garchen Rinpoche and became a monk in the Gar Monastry. From Ven. Kyabje Garmigyur Rinpoche, he took full ordination and received the instruction and transmission of the Yangzab teachings and had practiced the preliminaries completely. From his root lama, H.E. Garchen Rinpoche, Ven. Dhondrup received teachings and initiation on Mahamudra, the Six Yogas of Naropa, the great Drikung Phowa (transference of consciousness), Dzogchen and Yamantaka as well as the protectors according to the Drikung tradition. He has also completed many retreats on the nature of mind. Dorzin Konchok Dhondrup studied under many teachers including several Nyingma masters. Under Ven. Kyabje Pan Khenpo Tenzin, he studies Shantideva's The Way of the Bodhisattva, The 37 Practices of Bodhisattva, Nyingma's Dhomsum Nanye and Phowa. He also received Dzogchen Trekcho teachings from Ven. Kyabje Khenchen Munsel Rinpoche in Qinghai. For six years, he attended the Drikung Kagyu Institute, Jangchubling. Under Ven.Khenpo Togdrol and Ven. Khenpo Tashi, he studied the 5 Major Volumes of Philosophical Texts and Gampopa's Jewel Ornament of Liberation. With Ven. Kyabje Khenchen Konchog Gyaltsen Rinpoche, he studied Gongchik, Thekchen Tenpinyipo (The Essence of Mahayana, the SAme Intent and Uttaratantra and their commentaries) and The Seven Verse of Refuge in Arya Tara. He received the empowerment and transmission of the Treasury of Instructions from Kyabje Trulshik Rinpoche. He had also received many teachings from other highly qualified masters such as H.E. Choje Togden Rinpoche, H.E. Druwang Rinpoche and H.E. Ayang Rinpoche in Phowa. Over many years, H.H. 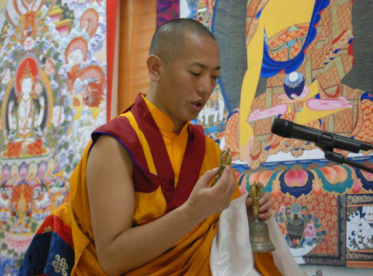 Kyabgon Chetsang Rinpoche has given him teachings, including the instructions and transmissions of the great works of Lord Jigten Sumgon and past Kagyu masters. He also received empowerment, transmission and instruction associated with the Five fold Path of Mahamudra, which he practiced from the preliminaries up to the Fire Puja of the Yidam deity Chakrasamvara. 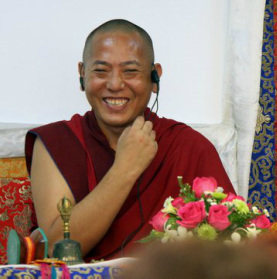 In addition, he received several different Mahamudra instructions and many Tantra practices. In June, year 2006, under the instruction of his root guru, H.E Garchen Rinpoche, Dorzin Konchok Dhondrup arrived in Singapore to establish the glorious Drikung Kagyu Lineage with Dri Thubten Dargye Ling Centre which was founded in 2007. He is the centre's resident lama, who has diligently conducted many Dharma activities and practices, faithfully fulfilling his root guru's intention and instructions.